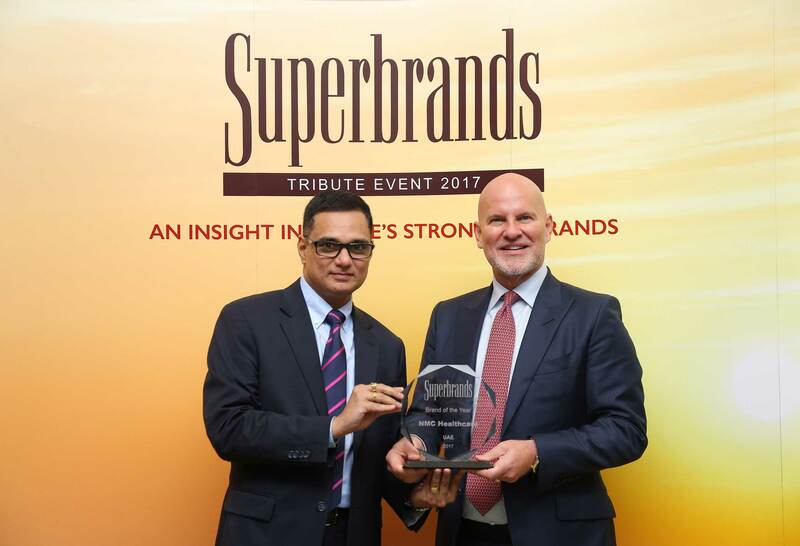 Superbrands, the independent authority and arbiter of branding, announced that ‘NMC Healthcare’ has won the coveted ‘Brand of the Year’ award at the 13th annual Superbrands tribute event, which was held at the Intercontinental Hotel in Dubai Festival City. Sixty-four leading brands from the UAE were awarded Superbrands status and the 2017 Superbrands book was unveiled at the event, also dubbed the ‘Oscars of Branding’, where the UAE’s strongest brands were honoured. Established in 1975, NMC is the largest private healthcare services provider and one of the largest wholesale and distribution businesses in the UAE. It also ranks amongst the top three fertility providers in the world. NMC does not restrict itself to providing medical care to its patients but tries to ensure that the patients can lead fulfilling lives ahead. Every day over 12,000 patients receive treatment at NMC facilities across UAE, Spain, Italy, Colombia, Denmark, Brazil, Saudi Arabia and Oman. NMC’s team of 1,200 doctors and 10,000 paramedical and support personnel manages eleven hospitals, fifteen medical centres, three long term care facilities, two day surgery centres, thirteen fertility clinics and one home health services provider. With over 2,000 leading brands in the UAE vying for the coveted Superbrands title, only sixty-four scored more than 80% of the total possible mark and were declared Superbrands by the Brand Council. Winning this accolade is a powerful endorsement and evidence for existing customers, potential customers, the media, suppliers, investors and employees of each brand’s exceptional status. This year, Superbrands were voted not only by the brand council but also by online voting, which has expanded the voting base to almost 2,000 senior managers and marketing professionals. The 2017 Superbrands book is a coffee table book, which includes a two-page profile of each Superbrand tracing the foundation and development of the brand and a ‘Things You Didn’t Know section’ highlighting interesting facts about the brand and its unique achievements was also unveiled at the Tribute Event. “This year it is heartening to see so many local home grown brands and some new entrants in the market make it into the Superbrands UAE book in addition to internationally recognized brands. To be voted a Superbrand is a powerful endorsement and is evidence for existing customers, potential customers, media, suppliers, investors and employees of each brand’s exceptional status,” Mr. English concluded.